Roberto Cavalli Fall 2011 Lookbook. Step into the world of opulence, exuberance, explosions of color and sophistication with a modern touch with the latest Roberto Cavalli fall 2011 lookbook. Break the monotony and get prepared to be fascinated by the eye-catching designs and breath-taking combinations envisioned by the renowned fashion house. The world of high end fashion always manages to dazzle us with unexpected visions and style interpretations that surpass our expectations and set new standards in terms of elegance and glamor. With a comprehensive list of outfit ideas and fabulous combinations that simply cannot go unnoticed, the latest Roberto Cavalli fall 2011 lookbook is a fashion lover's ultimate eye candy. The latest creations of the world renowned luxury brand completely eliminate the notion that the cold days outfits should lack exuberance, vibrant colors or instant magnetism and edginess. The grand fashion house offers a complete paradigm shift that can immediately intrigue and fascinate at the same time. Get ready to rethink your style boundaries and limitations and become instantly seduced by the luxurious world of ultra glam styles. From cutting edge day outfits to sophisticated evening gowns, the style possibilities offered by the brand seem unlimited. Top models Aymeline Valade and Olga Sherer express the label's style mission perfectly with gorgeous ensembles that are certainly not for the faint-hearted. Even at a quick glance throughout the collection, it becomes increasingly obvious that the animal print trend is definitely here to stay, at least till the end of the year. With elegance and creativity, these prints prove to be surprisingly versatile and completely attention grabbing. Highlighting your ferocious, wild side is beyond any doubt extremely easy if we are to judge by the jaw dropping ensembles created by the brand. Navigating through the urban jungle with a touch of glam and willingness to take a few fashion risks along the way proves to be the winning formula for the brand, which proves that breaking style rules can sometimes be extremely rewarding. Femininity is completely redefined with floor length dresses with extreme slits which can really test out a woman's confidence. Elegant long evening dresses with a slightly more conservative vibe are also featured in the catalog, yet the designs are anything but modest. Cutouts, sequins, golden touches and breath-taking accessories manage to make the designs irresistibly seductive and incredibly sophisticated. Another important trend highlighted in the collection is the fur fashion trend. Along with animal prints, fur accents or even entire fur pieces create that luxurious allure that really sets apart high end creations. In the myriad of perfectly fitting jackets, body hugging dresses and striking details, this trend really makes the collection stand out. The luxury label doesn't disappoint in the area of accessories either. 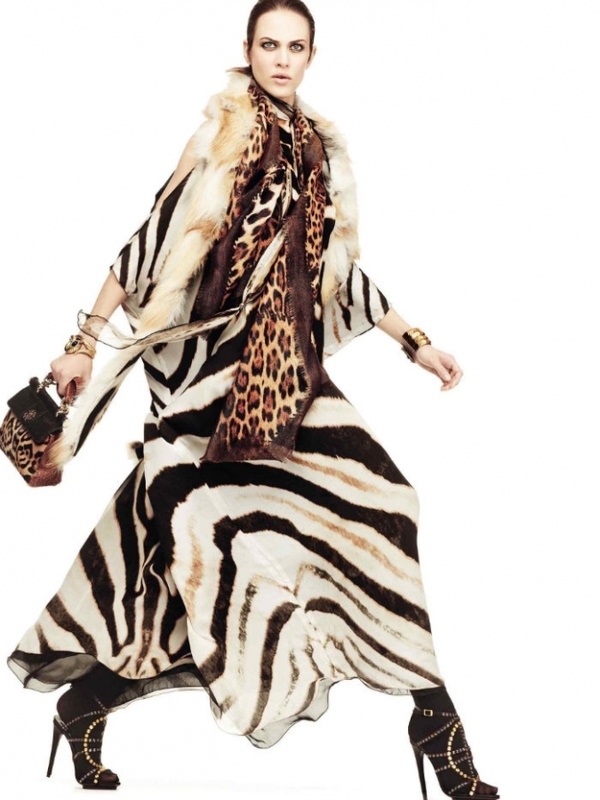 Animal prints and fur accents, statement jewelry, spacious handbags, long scarfs or killer heels are just some of the must haves for the season, in the vision of the designer. Unforgettable fashion statements, extreme sexiness and high class are the standards that have kept the brand in the spotlight for so many decades and the creations for the season certainly live up to the brand's standards.